Les Blog » Chillinâ€™ it, yo? Any strategies out there for keeping our must as cold as possible for about a week? Our pickle: no jacketed tanks, no heat exchange technology, limited access to dry ice, no way to seal the room and chill it down. We’ve tried wrapping fermenters in sleeping bags. We’ve tried partially submerging buckets of ice into the must. We’ve tried draping plastic across the top and layering that with ice. We’ve even tried sealing part of the basement in plastic and turning on the AC. With the exception of the AC, which completely failed, all of these produced moderately successful results, but they’re extremely manual in nature, heavily dependent on plastic and fraught with danger (think of a hole in the plastic or a capsized bucket). So we’re looking for the next big thing: any fluid dynamics experts out there? Any winemakers who’ve been there and iced that? Any MacGyvers with clothespins, underwear elastic and a will to chill? If so, leave us your suggestion in the comments, please! What’s the most elegant and inexpensive way we can cool down our must and hold it there? One of our perennial battles immediately after crush is keeping the must (“must” being the goo you get after you strip the clusters of their stems and drop them into a fermenter) cold for a few days before the fermentation begins. The general idea is that because most of the flavor and oomph of a wine is in the skins, giving the juice some extra time before fermentation to soak up skinny goodness is to your advantage (though of course, up to a point). In addition, because fermentation produces alcohol, and alcohol is a solvent, fermentation dissolves the amniotic sack around the seeds which acts as a natural barrier between the wine and the seeds’ bitter tannins. So the cold soak, because it happens before there’s any alcohol lurching around and hitting on your girlfriend, tends to soak up a higher percentage of good tannins (from the skins) than bad tannins (from the seeds). So the trick is to keep the must cold for a little while before fermentation begins. 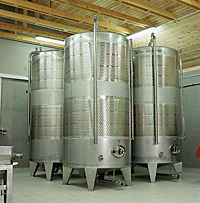 In many fancy pants (which is to say, vaguely capitalized) wineries, this is often accomplished via “jacketed” stainless steel tanks: towering cylinders of stainless steel with hollow bands wrapping them at key heights. In the picture at right, the textured parts of the tank are the jackets, through which glycol is circulated to regulate temperature. This one has two – to control two “zones” – but where they are and how wide they are is apparently as flexible as your winemaking style and your budget. In any case, these allow precise control over fermenting and pre-fermenting temperatures. Take the must down to 40 degrees and hold it there for a week for a frosty cold soak? No sweat. Want your fermentation to hit 89 degrees and stay there for 13.518 hours, just ’cause? Of course, sir, right away. The easiest solution would be a heat exchanger — some highly heat-conductive coil (my guess is that copper would be safe and, if so, ideal, but I really don’t know) in the fermenter. You could run it from the tap (advantages: ease of setup, constant cool temp; drawback: water bill) or in a closed line pumped through a fermenter filled with ice water (advantages: low temp, low water consumption; drawbacks: need to refresh ice, need to get a pump). sort of the same as Jame’s idea. encircle the tanks, outside, with copper tubing hooked up to a fawcet. run cold water through it constantly, screw the drought. Its a la nina year. Next year, set up the closed system pump he suggested. 30 bucks at home depot for the pump. another 20 for the copper tubing. get the kind that’s already coiled.